We’d love your help. Let us know what’s wrong with this preview of Don't Let Them Disappear by Chelsea Clinton. Did you know that blue whales are the largest animals in the world? Or that sea otters wash their paws after every meal? 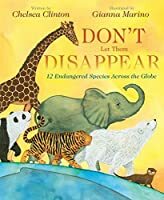 The world is filled with millions of animal species, and all of them are unique and s From the author of the #1 New York Times bestseller She Persisted comes a beautiful book about the animals who share our planet--and what we can do to help them survive. To ask other readers questions about Don't Let Them Disappear, please sign up. Read it to your children, brothers, sisters, nieces and nephews for a more responsible next generation. Chelsea Clinton and Gianna Marino team up to create this informative and beautiful illustrated unfortunate truth that explains how many of our fellow planet’s inhabitants are dying off at unprecedented rates. Knowledge is key to solving any problem and awareness is the first step. Please read and share this story with your kiddos and discuss ways you can help in any small or not so small way; Don’t Let them Disappear! I alway love Gianna's illustrations! I especially loved that there was back matter in the book that gave simple things children can do to help the endangered animals. It's one thing to raise awareness; it's another to take action. I have a feeling children will be moved to take action. There are also many non-fiction features to this text that make it great, and it would be better to take an animal a day at a time rather than try to read aloud the whole book in one "gulp." This was good. It has a whale shark and a blue whale in it - 2 of my favorites. It was a gift from my friend. This informative book will help young readers to learn about endangered species. Charming illustrations and quick facts fill the pages, with tips at the end on why and what we can do to help. Great informational book about endangered animals. This will be popular with my animal loving students. Spotlights animals big and small and the dangers they face. Provides readers ways they can help stop these creatures from going extinct.